The star-studded cast delivered the goods. Anna Netrebko sang Leonara - her prima donna dramatic outbursts, impassioned lines and rich tone were perfect for this traumatised character. Perhaps she went to all the rehearsals after all. Jonas Kaufmann, as Don Alvaro, interpreted the character with poise. It's very easy to sing everything loudly. Yet Kaufamann observed the composer's typically detailed musical directions - and took some well judged artistic risk to deliver some vulnerable pianissimi. 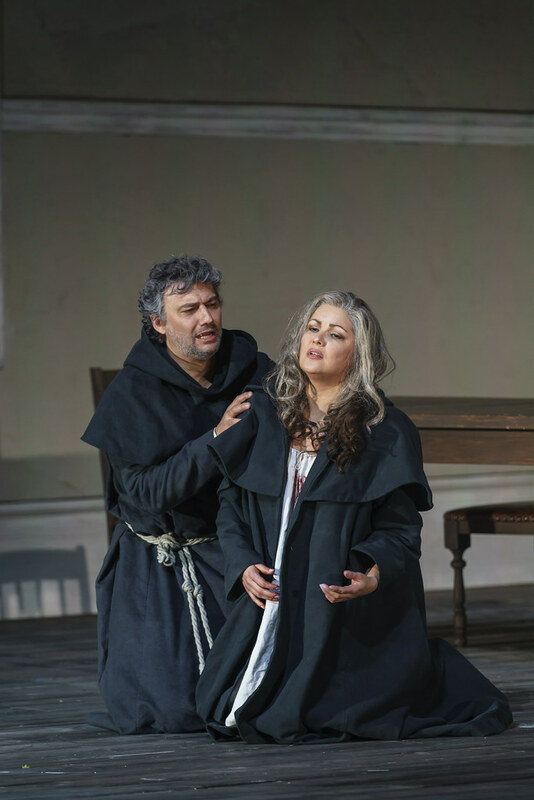 Not to be outshone, Ludovic Tézier's Don Carlo was heroic and determined. Ferruccio Furlanetto (did I say star-studded), appeared as Padre Guardiano, brought some deep vocal lines to underpin the religious scenes. Antonio Pappano's magical baton ensured the constellation of stars were aligned to deliver an intense and passionate performance.